Cree kept the price pressure on the residential incandescent-replacement market, introducing a 100W-equivalent bulb under $20 and dropping prices across the line. Allow me to quote myself from three weeks back, on the occasion of Philips's announcement that its 75W and 100W-equivalent bulbs had qualified for Energy Star status: "I fearlessly predict that rather soon we will see an announcement out of Cree trumpeting that its 75W bulb has been ES qualified, and announcing a 100W bulb." While we don't have the Energy Star announcement yet, it's being reported that the company has submitted both its 75W and 100W for that certification. Cree's 100W is now the cheapest 1600-lumen bulb on the market. Price cuts in the rest of the line average around 20% (see table). 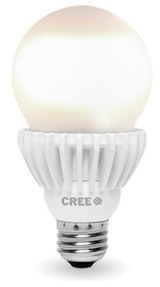 This brings Cree's 60W bulb under $10, before rebates, for the first time. (The price cuts were announced on the 1-year anniversary of the introduciton of its first consumer bulb, the 40W. Cree's 60W offering is now at par with the Philips SlimStyle, which has rather been stealing Cree's thunder since its announcement last December. Cree's bulb is A21 size, as is the one from Philips, due to the larger heat sink required. Perhaps if Philips goes to 1600 lumens in its SlimStyle form factor, it could hold the size down to A19. If anyone would like to rough out the heat-flow calculation in the comments below, that would be welcome. Like the rest of Cree's residential line, the 100W bulb is dimmable, rated for a 25,000-hour lifetime, and warrented for 10 years. It comes initially in Soft White (2700K); a Daylight (5000K) version is promised. The CRI is 80 and efficacy 89 lm/W. From the photos, the bulb evidently uses the same "filament tower" design as the rest of Cree's line, which is to be expected: holding to a common design is a big part of Cree's ability to keep prices low, and now to cut them. For what it's worth, I now see the Energy Star qualified, Philips 100W-equivalent priced at $14.97 on the Home Depot site. Your mileage may vary, as Home Depot tries to determine your geographic location and drops the displayed price if it thinks you live in an area covered by energy-company rebates. If you thought the price competition in the incandescent-replacement segment was fierce before, just wait. This pricing environment does not bode well for smaller players such as Switch.